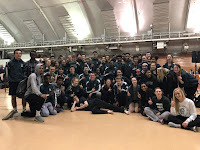 Tuesday night the Spartan track and field competed in one of the most competitive if not THE most competitive conference in the state of Wisconsin. We battled the weather, the competition, and the ups and downs of track and field all night. In the end the girls finished in 7th place with 48 points and the boys finished in 8th place with 49 points. We have taken many strides this year as a team but have a lot of work to do to reach the goals that we as coaches know our school and our track program are capable of accomplishing. We hope to continue to build around our young group of talent. On the girls side of competition we were led by Juniors Marrisa H and Corrine F. Marrisa placed 1st in the 200m dash in 26.99, 4th in the high jump with a leap of 5' 0", and was a member of the 4 x 200m team that finished in 5th place. Corrine took 1st place in the discus with a toss of 126' 01" and added a 5th place finish in the shot put with a put of 34' 6". The 4 x 800 team of Sara P, Danielle G, Sara N, and Hannah L combined for a 5th place finish with a time of 10:21.21 additionally McKenna G, Anna H, and Rachel B joined Marissa for the 5th place finish in the 4 x 200. McKenna also scored a 3rd place finish on her own in the 100m dash with a time of 12.92. Freshman Phibi M made the hurdle finals in the 100m hurdles and finished in 8th place with a time of 17.63 to score some team points. Hannah L ran in a super competitive 400m dash to earn a 5th place finish in 1:00.58. In total the girls team had 21 underclassmen who competed at this years Big 8 Championships and we hope these girls are hungry to improve in the off season to come back next year and score more points at the Conference Meet. On the boys side of competitiong we were led by Sophomore Daurice F. Daurice finished in 1st place in the 110m and 300m hurdles in 15.00 and 39.64 respectively and added a 4th place jump in the long jump of 21' 4.25'. Daurice was joined in his hurdling success by Junior teammate Nick M who made the finals of the 110m hurdles and placed 6th in a competitive 300m hurldes in a time of 41.98. Blake TJ had a great night just missing out on a conference championship finishing 2nd with a vault of 12' 9". The boys relay team of Robbie E, Hunter H, Josh P, and Ben A combined in the 4 x 800m relay to place 5th in a time of 8:28.61. Alex K made the finals of the 200m dash and placed 6th in a time of 24.28. Jordan B ran a 4:42.31 to place 8th in the 1600m and score a point for the team. Jonah W ran a 9:53.24 for 6th place in the 3200m run. The 4 x 400m relay team of Robbie E, Kaayvon GH, Jordan B, and Josh P ran a 3:35.9 for 8th place. Rob S made the finals of the shot put competition and Cam N made the finals of the discus competition. Rob finished in 8th place with a toss of 45' 10". The boys have 17 returners for the Big 8 meet and will need to put in a lot of work to make strides next year and into the future. We believe it can be done because we have seen the talent on this team and look forward to combining with the great work ethic we learned this track season all year long.